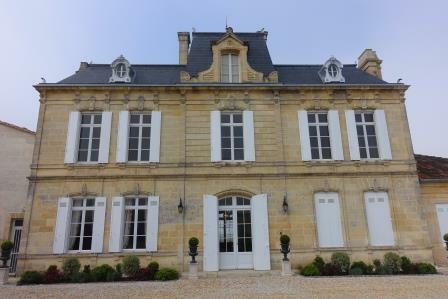 Chateau Nenin had been the property of the Despujol family starting in 1840. It’s quite possible that the Despujol family actually founded the estate and planted the initial vines for their Pomerol vineyard. That families ownership of the chateau changed in 1997, just before the harvest. The new owners were experienced in managing a Bordeaux chateau as they already owned Chateau Leoville Las Cases located in the St. Julien appellation and Chateau Potensac situated in the Haut Medoc. It was natural that the Delon family would purchase the property, due to their relationship with the Despujol family, as they were cousins through marriage. Chateau Nenin has the distinction of having one of the few grand chateau in the appellation with its large, 19th century stone design. In fact, the chateau would be equally at home in the Left Bank with its regal splendor. Chateau Nenin expanded their already sizable holdings in 1999 with the purchase of 4 additional hectares of vines from Chateau Certan Giraud. In that transaction, Christian Moueix purchased the remaining hectares and created Chateau Hosanna and Chateau Certan Marzelle. This was followed by a renovation of Chateau Nenin in 2004. It took a while until the Delon family began the march to quality for Chateau Nenin. Starting with the 2015 vintage, everything changed. Yields were reduced, grapes were allowed to gain better maturity and the wines quickly began to show for the better, as evidenced by my tasting notes for the vintage. Genevieve d’Alton has continued making a more active role in managing Chateau Nenin these days. The large 32 hectare vineyard of Chateau Nenin is planted to 78% Merlot, 21% Cabernet Franc and 1% Cabernet Sauvignon. 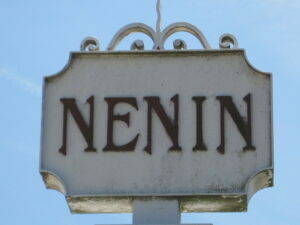 This is a marked change for Chateau Nenin as the estate at one time was planted with 20% Cabernet Sauvignon. The change to more Merlot in the vineyard has added a lot of depth and softness to the wine. The terroir is a mix of gravel, clay and sand with some iron in the soil. The vines are on average close to 30 years of age. However, there are old vines, some of which are more than 50 years of age. The vineyard is planted to a vine density that ranges from of 6,300 vines per hectare to 7,100 vines per hectare. The higher levels of vine density are found in the newer plantings. Wine making at Chateau Nenin in Pomerol is traditional. Fermentation takes place in stainless steel, temperature controlled vats that range in size from 70 hectoliters up to 160 hectoliters. On average, Chateau Nenin is aged in 30% new oak, or less, for an average of 18 months, depending on the vintage. While Michel Rolland is used as their consultant I do not see his touch at Chateau Nenin as the wines of Chateau Nenin are masculine and quite structured by nature and do not display the typical, lush, velvety qualities found in most Pomerol wines. Perhaps this has to do with the large amount of press wine added to the blend. In some vintages, as much as 20% press wine has been added to the blend. That is until the 2015 vintage, when the wines began showing marked improvement. Chateau Nenin produces a second wine, Fugue de Nenin. The wine of Chateau Nenin clearly ages well. A recently tasted bottle of 1961 Chateau Nenin was quite a treat. Chateau Nenin can be enjoyed on the young side with 1-2 hours of decanting. This allows the wine to soften and open its perfume. Older vintages might need very little decanting, just enough to remove the sediment. The wine is better with 6-10 years of bottle age. Of course that can vary slightly, depending on the vintage character. In the best years, Chateau Nenin will be at its best between 10-25 years of age after the vintage. Chateau Nenin is best served at 15.5 degrees Celsius, 60 degrees Fahrenheit. The cool, almost cellar temperature gives the wine more freshness and lift. Chateau Nenin is best paired with all types of classic meat dishes, veal, pork, beef, lamb, duck, game, roast chicken, roasted, braised and grilled dishes. Chateau Nenin is also good when matched with Asian dishes, hearty fish courses like tuna, mushrooms and pasta. With an over-riding floral character, the wine also displays cherry, plum and truffles. Elegant and nuanced, there is a beautiful purity in the fruits and silkiness in the tannins. The finish allows you to savor the sweetness of all the soft, red fruits. This is easily the best vintage of Nenin produced in modern times. The wine is vibrant, soft, fresh and filled with ripe, earthy, sweet, mocha filled plums and black cherries topped with truffles. Earthy, dark cherries, plum and licorice in the nose and on the palate, the wine is smooth and curvy, medium/full bodied with freshness and length. You’ll find juicy black and dark red plums with spice on the back end. The wine was made from 75% Merlot and 25% Cabernet Franc and reached 14.47%. Strict in nature, the plummy, cherry nuances are on the nose and palate. There is freshness, with a crispness to the tannins and fruit. The wine will benefit from 6-10 years of age. Earth, truffle, smoke, caramel and candied cherries, this is solid vintage for Nenin, filled with fresh, spicy cherries and soft, sweet black raspberries in the finish. Solid, and a little bit tough in its classic, bright, red plum and cherry personality. Spicy, forest and kirsch notes open to a firm, licorice and dark cherry filled wine with a hint of dryness in the tannic, plummy finish. With truffle, mineral and dark cherry in the nose, this powerful, tannic, dark wine ends with plum and black cherry. Give it a decade to soften. Showing its age in the color and with its secondary nuances of truffle, forest, herb, tobacco leaf and plums, the medium bodied wine has softened and added more sweetness to the red fruits. There is a bit of masculinity on the palate, but with a bit more aging, that should soften as well. Medium bodied, with a melange of peppery, cherries and herbs on the palate, this is fully mature. The wine was made blending 76% Merlot and 24% Cabernet Franc. Wet earth and plums in the nose, paired with fresh, tannic, red plums and herbs in the finish. This structured style of Pomerol needs another 5 more years to develop and soften. Black cherries, earth and strawberry scents lead to a masculine, rustic, style of Pomerol. The wine ends with red and black plums. Still young, this should soften and perhaps become less brawny in style with more time. Fully mature, with a strawberry filled midpalate and tangy, red berry and tapenade finish. Truffle, dark plum, fennel and cherry notes in the nose open to a masculine, structured style of Pomerol that is ready to drink. Firm structured style of Pomerol that is presently more exciting on the truffle, cherry, thyme and floral nose, than on the still, tannic, fresh, and slightly stoic palate. It's always fun tasting older Pomerol, even when it's on the austere side. Still, there was enough plum, tobacco and forest floor to make this old school expression interesting. However, it's not a wine to age any further. In great shape for a wine that is approaching 55 years of age, with a nose of earth, tobacco, smoky cherries and cigar box aromas, the wine is not on the elegant side, but it offers a lot of sweet and tart, old school charm and tasted 20 years younger than its true age. Brick in color, the wine shows its age with its tobacco, smoke, earth, cherry and truffle nose. Slightly rustic on the palate, the wine ends with with spicy cherries, smoke and earthy sensations. Fading far too quickly in the glass, the wine is holding on to life by the skin of its teeth. Other, older vintages of Nenin have been much stronger.